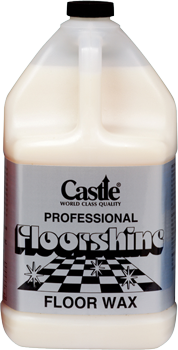 Formulated to withstand high traffic wear, Castle® Floorshine skid-resistant floor wax guards against black marking, scuffing, and powdering. It will stand up to industrial cleaning solutions, yet can easily be stripped. The clear, odorless, non-yellowing formula provides excellent re-coating ability. 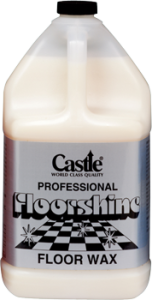 Spread evenly to provide a tough, high-gloss finish to all types of resilient and hard floor surfaces. Dries in 20 minutes; no buffing required. One gallon covers 300-400 square feet. 1. Remove old wax with Econo Floorwax Stripper™ . 2. Apply thin coat with sponge, mop, or string mop using a figure-8 application. 4. Apply a second thin coat.